Quick overview Miraculously preserved on clay tablets dating back four thousand years, the poem of Gilgamesh, king of Uruk, is the world's oldest epic. The story tells of Gilgamesh's adventures with the wild man Enkidu. This text is translated by Andrew George. Miraculously preserved on clay tablets dating back as much as four thousand years, the poem of Gilgamesh, king of Uruk, is the world's oldest epic, predating Homer by many centuries. The story tells of Gilgamesh's adventures with the wild man Enkidu, and of his arduous journey to the ends of the earth in quest of the Babylonian Noah and the secret of immortality. 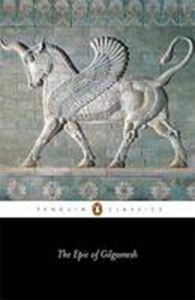 Alongside its themes of family, friendship and the duties of kings, the Epic of Gilgamesh is, above all, about mankind's eternal struggle with the fear of death.